Grothouse offers a variety of Exclusive Products created to enhance the appearance, function, and overall quality of Grothouse Wood Surfaces for your upmost convenience. All solid wood products by Grothouse are custom made for your design. Durata® Wood Countertop Finish is exclusively available at Grothouse and is only available for purchase on a Grothouse countertop surface. Durata® is a permanent finish that is completely waterproof and chemical proof after 30 days. It is FDA approved for indirect exposure, like kneading dough. It is also Greenguard certified. The finish is not affected by Lacquer thinner, Ammonia, Red Wine, Vinegar, Oil, Ketchup, Mustard, Bleach, or Soaps. The Anvil™ line of metal gilded wood surfaces imitate metal countertops in look and function. 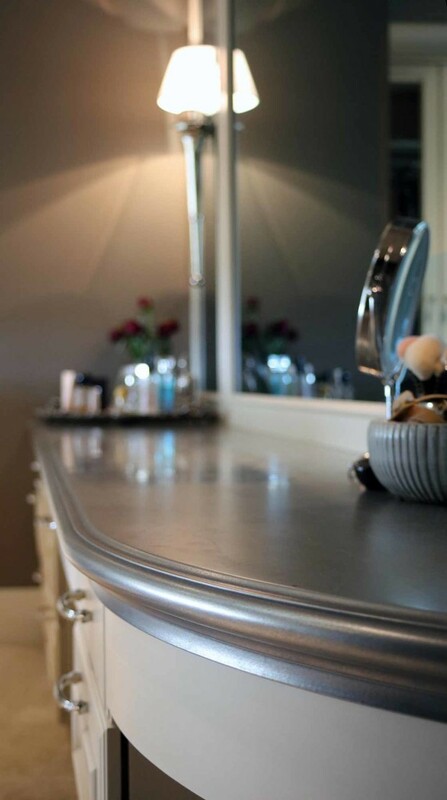 Available in 8 metal coatings, Anvil™ metal countertops by Grothouse have no limitations in design. The Butcher Block Work Table was inspired by our featured piece in House Beautiful magazine for “Kitchen of the Year 2011” designed by Tyler Florence. The table provides your kitchen with a warm, contemporary feel and includes many features for your upmost convenience. Four drawers for convenient storage, an integrated knife slot provides an area to put an assortment of knives, rolling casters allow the table to be positioned anywhere in your kitchen and magnets are installed in the back for attachment to the desired place for the butcher block table, such as your kitchen island. Paul Grothouse engineered the Synthesis™ Bar Rail by developing methods that permit the bar rail to be carved from the same solid wood piece as the bar surface. These features create a more substantial bar rail that is easy to clean. The Butcher Block Prestige Chef’s Box™ is a classically designed cutting and serving board storage system only available at Grothouse. It is designed to fill all of your kitchen food preparation, cutting, chopping and food presentation needs. Our team of engineers and skilled craftsmen fashion each custom tread to exact specifications to execute a flawless layout. 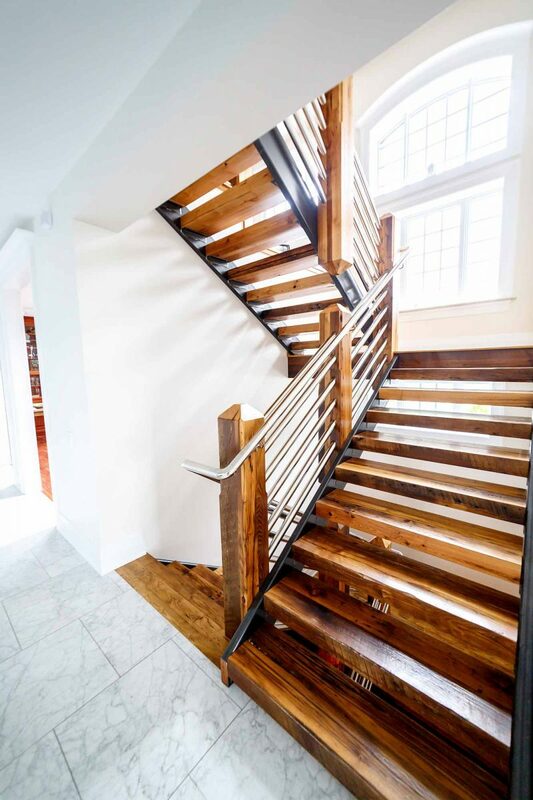 Wood stair treads add a beautiful finished work of art to your home. Saxon Wood™ is the first of a series of specially curated woods, hand selected and sourced by Paul Grothouse. Saxon Wood™ has been chosen for its stunning visual appeal and unique appearance. Saxon Wood™ Counters, Bar Tops, and Butcher Blocks are exclusively available at Grothouse. Kensington™ Wood is the second in a series of specially curated woods, hand selected and sourced by Grothouse. 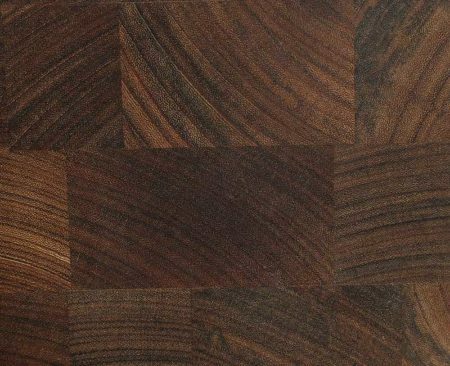 Kensington™ Wood has been chosen for its striking visual appeal and lustrous finish. Kensington™ Wood countertops, bar tops, and butcher blocks are exclusively available at Grothouse. Integrated Bowls in Wood Countertops or Butcher Blocks are custom carved to client specifications. Integrated Bowls are used to fruit or eggs from rolling off the countertop. They can also be used for a decorative touch. Integrated bowls can also be crafted into a sink when sealed with Durata® waterproof wood countertop finish. Grothouse Solid Wood Pastore™ Tables are the latest design trend in luxury homes. This style is made up of a solid wood countertop that is mitered to solid waterfall legs, creating the appearance of a continuous surface.